Buh-bye! In the Tuesday, March 22, episode of FX&apos;s The People v. O.J. Simpson: American Crime Story, “A Jury in Jail,” Marcia Clark (Sarah Paulson) and Johnnie Cochran (Courtney B. Vance) tried to outdo one another by getting each other’s preferred jury members dismissed. The jurors themselves were battling with one another too, as they went crazy from isolation in sequester. The episode opened on day 124 of the trial to determine whether O.J. 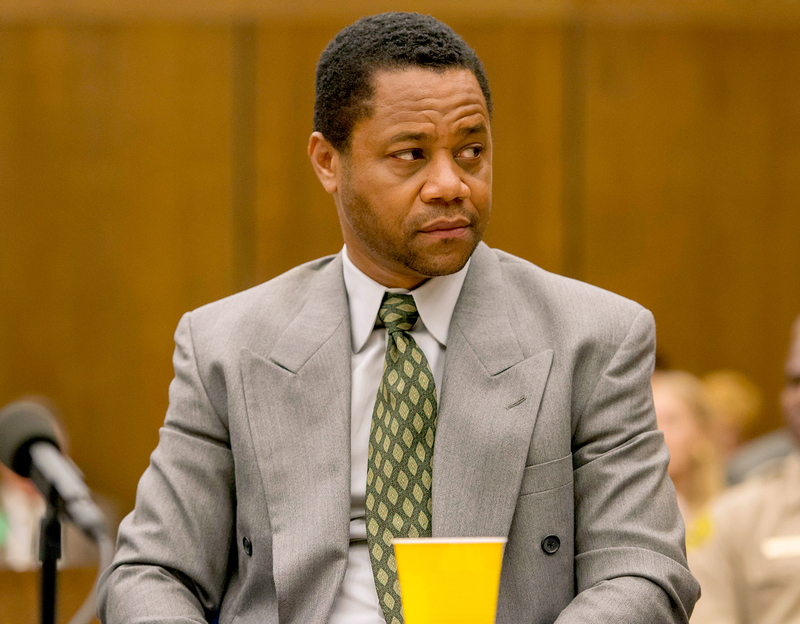 Simpson (Cuba Gooding Jr.) was guilty of murdering his ex-wife, Nicole Brown Simpson. A police officer was berating an exhausted-looking jury for showing up a few minutes late in the morning. When one woman asked where their typical guard was, the new guard threatened to arrest her. They all began screaming again, bemoaning that they were cooped up in a hotel with no television, no magazines, no alcohol and barely any contact with their friends or families. Then the episode flashed back eight months to the beginning of the trial to show a much happier jury being escorted into the Intercontinental Hotel, where they believed they’d be on a little vacation for a few weeks. Only after they found they had no access to TV, the pool or even each other or their families without supervision did they realize what was going on. It was too late to back out. While the jury couldn’t even speak to one another about the case, the defense, helmed by Johnnie and Robert Shapiro (John Travolta), strategized while looking at all of the jury members’ photos, referring to each by a code name. Meanwhile, the prosecution — namely, Chris Darden (Sterling K. Brown) and Marcia — was still reeling from the horror of how badly the glove demonstration had gone. They fought among themselves about how to proceed just as the members of the jury fought among themselves over what to watch during their allotted group TV time. The prosecution had one hope left to win after the glove incident: DNA evidence. When the specialist was called to the stand, the jury looked like they might be asleep. The use of DNA evidence was relatively new at the time, and they weren’t familiar with it at all. To them, the scientist’s testimony sounded like gibberish. Still, his testimony was big. He claimed that all of the blood found at the scene, at O.J.’s house and in the athlete’s car was from the same person and that it was so unique it could only come from one person in every 170 million people. The scientist identified O.J. as that person. Robert Kardashian (David Schwimmer) went to visit O.J. later in a visiting room at the jail. He asked his friend how Nicole’s blood had gotten on all of his possessions, saying it was starting to look bad in the eyes of the jury and O.J.’s own defense team. O.J. had no answer. Kardashian was even more nervous and consulted with his colleague, Barry Scheck (Rob Morrow). Barry told him not to worry. When it was his chance to cross-examine the scientist, Barry spent six hours asking pointed questions about how the LAPD mishandled evidence and could have gotten O.J.’s DNA all over the crime scene, making all of the DNA evidence very weak. Upon getting back to her office, Marcia trashed the place in a rage. The one thing the prosecution did have going for them was their ability to have jurors dismissed. Systematically, they combed the records of each juror, bringing infractions like prior arrests or incidences of being abused to the attention of Judge Ito (Kenneth Choi). For their purposes, it was a great plan. Optically, it was awful; both dismissed jurors were black. They were replaced by white alternates. There was one alternate juror the defense was desperate to avoid seeing on the jury because she was renowned for being difficult, disliking Johnnie and voting to convict. They vowed to make sure no other jurors would be killed off by the prosecution, but Marcia and her team were one step ahead, determined to get the last alternate juror in. In the end, the prosecution got their way: The difficult juror was selected from the alternate list. The jury eventually took a stand for themselves after growing tired of seeing one another dismissed with no explanation and feeling as though the guards, judge and authorities were mistreating them. They simply all refused to come in one day. Judge Ito screamed that he wanted the deputies to force them to come in, or he would hold them in contempt of court. They filed in quietly, almost all dressed in black by way of protest. One of the top journalists covering the case, Dominick Dunne (Robert Morse), appeared on Larry King Live to talk about what people were calling the "Juror Revolt.” Johnnie screamed when he saw the interview, insisting that they’d lost control of the jurors, even those they had been sure would vote not guilty. F. Lee Bailey (Nathan Lane) suggested they had Stockholm syndrome. O.J. had a meltdown when he learned that they were discussing a mistrial as a possible option. He begged his lawyers to allow him to testify. The attorneys argued among themselves, debating if he was loved enough by the public for it to draw sympathy or if Marcia was too harsh and would destroy him. They agreed to let O.J. do a “trial run” or rehearsal, for which they hired a Marcia look-alike to grill him in his holding cell. One of the jurors in particular was having a rough time in sequester. She spent the episode acting agitated, paranoid and accusatory, even begging Judge Ito to dismiss her at one point. It was revealed that it was her complaints that resulted in the rotation of the guards. She ended up cracking under the pressure one night at dinner. She kicked off her heels, began shrieking and launched herself for the door. It took three officers to subdue her. That incident and the threat of mistrial caused Johnnie to call a ceasefire with Marcia. He brought her a coffee as a way to make peace and imply that he was no longer interested in playing games and trying to suspend her jurors. Kardashian was not feeling as peaceful, especially after watching O.J. flub his rehearsal testimony. He went to pick his kids up from ex-wife Kris Jenner (Selma Blair) and began to cry in her kitchen. Nicole had been Kris&apos; best friend, and Kardashian&apos;s defense of her possible killer put even more of a strain on their relationship. He apologized to her and cried on her shoulder, saying he couldn’t wait until O.J. was out of their lives forever. Across town, the O.J. tip line rang. The person calling wanted to anonymously tell the defense that they had a recording of key witness Detective Mark Fuhrman (Steven Pasquale) using a racial slur and talking about framing black people. Tell Us: Would the case have gone differently if the jurors weren’t so burned out?